Birds of Chicago start with a basic blueprint before an eclectic and innovative streak stretches the content to wherever you want it to go. The assets begin with the primal rock ‘n’ soul qualities of JT Nero and Allison Russell. The juxtaposition of the rugged and the beautiful blends and twists in epic proportions to bring a raft of boundless songs. Throughout the meandering journey with an open invitation to enrol, a tight production provides the checks and balances to ensure eleven gift-wrapped original efforts flood out to form a third full-length release from this American duo. LOVE IN WARTIME is an album requiring care and attention, but rewards the diligent listener. JT and Allison have kept Birds of Chicago productively active since the inception in 2012. Prior to that, JT and the Clouds and Po Girl ensured both were respectively and individually busy in previous bands. Po Girl in particular spawned at least two later successful follow on careers for Awna Teixeira (solo) and Allison with husband JT. For this studio album, the duo have enlisted the services of Luther Dickinson (North Mississippi All Stars) as producer and hooked up with respected label Signature Sounds Recordings. This powerful formula has created a spiritually uplifting record ready to continue a fulfilling journey. You can flip a coin to whether a preference lies within the groovier upbeat numbers or when the tenderer moments take hold. Of course taking each style on their merits is a perfectly acceptable approach. For me, the two anchor track positions of #3 and #7 step out from the crowd as early leading contenders for songs to pick off. 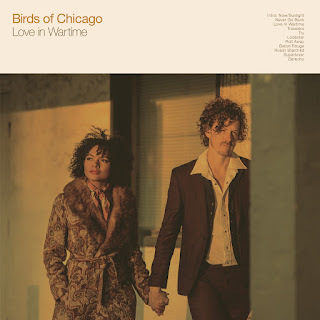 ‘Love in Wartime’ , the track, does more than just host the album title, and early in the record it motivates immensely through a tranquil beginning expanding into a grander rock ballad. A compelling string sound accompanies JT’s vocals in the opening before Allison moves the track into duet territory. ‘Roll Away’ is an outright rocker, illuminating from first listen and a track that never wanes from its summit as the lesser songs fight their way onto your horizon. For those liking things spiced up a little, ‘Never Go Back’ ratchets up the sound in a funky direction by injecting some serious groove straight after a one-minute instrumental opener sets the scene making this eleven track album essentially ten songs.‘Derecho’ is a tough track to grasp in the album closing position and definitely signals that any blueprint has been discarded. Pushing the two nominated top tracks close is ‘Baton Rouge’, one of a handful of co-writes between the pair on the record (all tracks feature JT as either the sole writer or in tandem) and is blessed with hypnotic qualities. A little delve into the French language in the chorus is not the first time Allison has used her bi-lingual skills on a record and they certainly add to the eclectic nature. At this point, it is worth noting that Birds of Chicago have fully re-instated the UK on their touring map after obliging us only a fleeting visit to promote the last album. This is further boosted by their selection as one of Rhiannon Giddens curated acts for a slot at this year’s prestigious Cambridge Folk Festival in August. Of the remaining tracks, ‘Try’ is one where JT’s vocals shine at their rugged best, while ‘Travelers’ gets back into a soulful groove after the dexterity of the title track. ‘Lodestar’ and ‘Super Lover’ both had a preview via an uploaded video, so click on the link and check them out for yourself. ’Roisin Starchild’ sees Allison take the vocal lead and probably is as soulful as the album gets. LOVE IN WARTIME has its major selling point in the sound and vibes emanating from its key architects and associate musicians. Soaking up these is a recommended listening decision as well as tapping into what Birds of Chicago do very well.